“Adam” (not their actual name) is a talkative, rambunctious kid. One of our staff was sitting with him to supervise during the first lesson when his 1st grade class was learning to chop veggies with safety knives. The lesson was “Taste the Rainbow”, about the nutrient importance of eating vegetables of different colors, so we were chopping everything from purple cabbage to red peppers. “Adam” quickly finished with the veggies on his cutting board, and looked longingly at the pile he’d chopped. “Do I have to wait to eat them? They look so good!” With permission, he started snacking away on his “rainbow salad”, and ate three salad plates full of veggies. We actually encourage students to eat veggies from the garden (so long as they leave enough for other classes), so we told “Adam” he wasn’t doing anything wrong. “Adam” got quiet for a minute, and then asked, “Could I bring home veggies for my mom and little sister? They don’t ever get to eat veggies, and I know they’d love them too.” We found him a ziplock bag in which he carefully gathered all the extra veggie from the lesson. Hudson Valley Seed is thrilled to announce that they have hired a new Executive Director, Hans Hageman, who will start in his new role in mid-August. After Hudson Valley Seed’s founder Ava Bynum left last year to pursue new work, Hudson Valley Seed’s Board of Directors and staff have sought out an organizational leader who will continue the organization’s highly successful program implementation, commitment to systems change, passion for education and nutrition, and local Hudson Valley focus. Hans was raised on a diet of social justice, growing up in Exodus House, a residential drug treatment center in East Harlem run by his parents Rev. Lynn Hageman and Leola Hageman. Hans and his brother Ivan later changed the space into the highly-regarded East Harlem School, where they not only transformed the academic outcomes for their students, but also radically shifted publicly-funded cafeteria system norms by feeding their students entirely plant-based meals. A graduate of Princeton and Columbia Law School, Hans brings expertise as founder and Executive Director of multiple schools and education-based nonprofits including the Boys and Girls Harbor in NYC. He is also certified as a Permaculture consultant through Geoff Lawton’s Permaculture Research Institute, and has worked with Cheryl Rogowski (the first farmer to win a MacArthur Genius Award) to plan a farming school for women from around the world. Most recently he has served as Interim Executive Director of Children of Conservation, an African wildlife sanctuary program, as well as leading his own marketing consulting business. After deciding to move with his family out of the city, Hans now calls the Black Dirt region of Orange County home, and is glad to apply his expertise and time to improving the education and nutrition of local kids in the Hudson Valley. Hans will be leading Hudson Valley Seed’s garden education programs and staff; liasing with the four school districts in which the organization works and with the many farms, business partners, and individuals that make local students’ garden learning possible; and laying the groundwork for the organization’s continued expansion. Hans also contributes to the local community as a volunteer firefighter and fitness trainer, and enjoys blacksmithing - an excellent fit with the multi-talented staff team he will lead. Hudson Valley Seed is a nonprofit based in Beacon, NY, and operating in ten elementary schools serving more than 5,000 students in Newburgh, Kingston, Beacon, and Garrison. 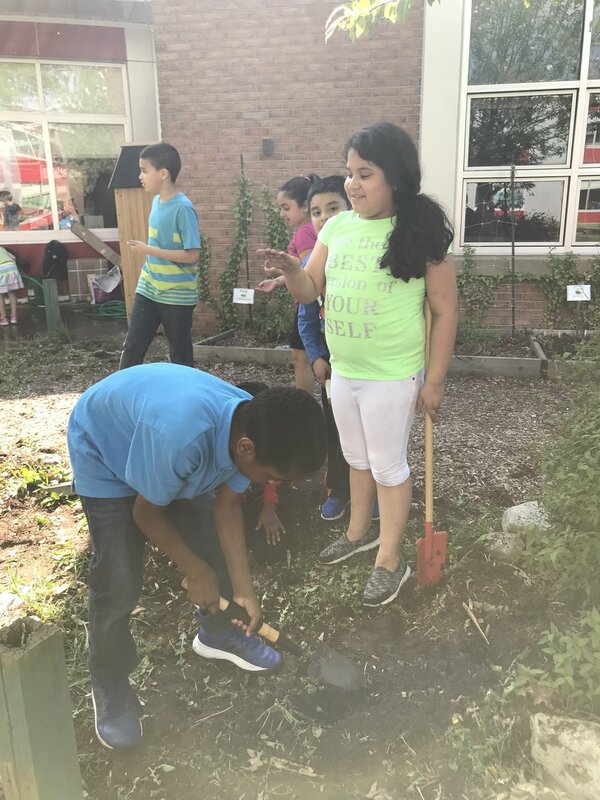 Hudson Valley Seed garden educators teach children in school gardens, empowering students during the school day through curriculum-integrated lessons focused on healthy eating, food literacy, outdoor learning, and academic success. Learn more about their work at hudsonvalleyseed.org. In addition to our year-round crew of garden educators, we're so lucky to have an amazing expanded team this summer. Read below to meet each of our awesome new colleagues! Kathryn Brignac recently made the Hudson Valley her home along with her partner and their Pit Bull, Petunia, after years of enjoying visits with family in the area. She has a Bachelor's of Science in Conservation Biology from the Evergreen State College in Olympia, WA, where she spent time working with environmental education groups, gleaning produce from local farms, and delighting in the natural environment. Returning to her hometown of New Orleans after school, she began gardening on her porch and joined the local food cooperative, where she enthusiastically worked at getting healthy food into people's homes and helping people of all ages learn to love their veggies. Growing up on the Gulf Coast, she has a passion for cooking and the outdoors and spends her time off hiking, birding, and trying out new recipes. Kathryn is looking forward to spending the Summer helping out in the gardens and assisting with education programming for the Fall. 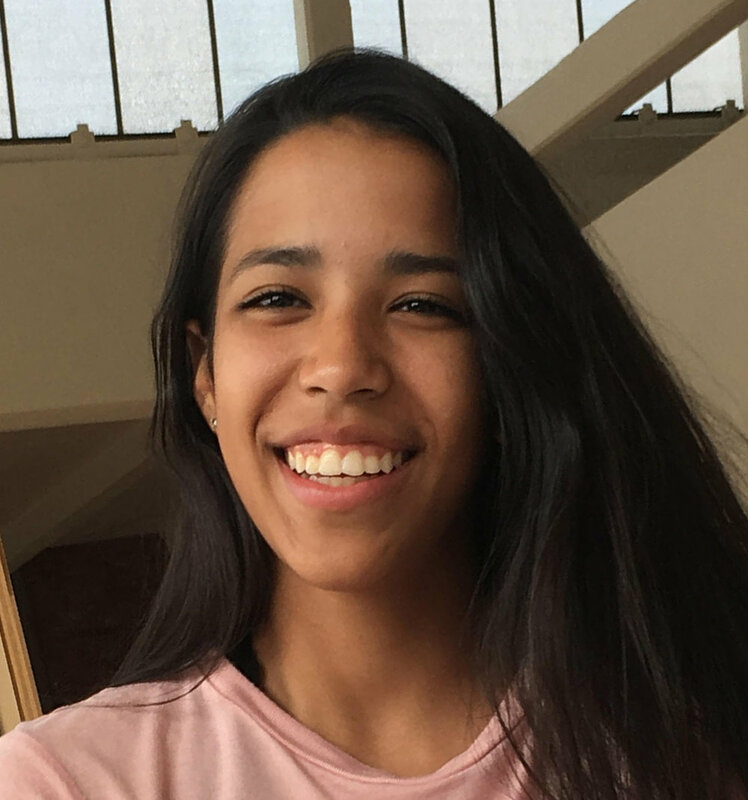 Isabela Leon Ferrer is an incoming college freshman at SUNY New Paltz. Last summer she found an interest in agriculture and the ways food is produced through working with Green Teen. This summer she was given the opportunity to work with Hudson Vally Seed through a next step position to grow and further explore theses interests. She hopes to teach what she had learned to kids throughout the community and continue to learn even more herself along the way. On her free time Isabela enjoys spending time with her fellow Beacon Players, the high school drama club, and putting on shows. Kindu Green Jr is a recent graduate of Beacon High School. His interest in joining Hudson Valley Seed “sprouted” when his twin sister did it a few years ago. Since then, he’s joined Green Teen which is a very similar program to Hudson Valley Seed, where he learned many things and this helped his interest “grow”. Kindu has also been helping his grandma with her gardens since he was young. This involves anything from watering plants to lifting heavy bags or even wheelbarrows full of rocks and soil, so participating in HVS is well within his capabilities. He enjoys the teamwork and intimacy of working in small groups as well as helping out wherever he can. In his spare time, Kindu is most likely hanging out with friends, writing, or drawing. Kindu hopes he will “blossom” into a hardworking crew member by then end of the season. Maurice is 20 years old, lives in Newburgh, and is taking part in the Orange County Youth Bureau's Student Youth Opportunities Program. Maurice likes to weed out the grass and water the plants. He enjoys playing video games in his free time. What happens with our school gardens in the summer? Throughout summer, Hudson Valley Seed grows crops to be ready for harvest when school starts in September, and we also harvest throughout the summer for education programs and for donation to food pantries. We expect to donate more than 1,000 pounds this summer! Looking to keep connecting your young ones with accessible healthy food over the summer? Check out these lists for the Newburgh and Beacon free summer lunch sites, soup kitchens, and food pantries that Hudson Valley Seed will be partnering with this summer. Big thanks to Shayna Russo, Eat Smart New York Hudson Valley Region's Regional Coordinator at Cornell Cooperative Extension, for creating these resources. Contact Shayna with any updates! The Newburgh GAMS school garden also had a successful garden work day! 4th and 5th graders helped to assembled 2 new garden beds, helped with weeding, and cleared out an area for a pumpkin patch! We are grateful to the GAMS families, staff members, and students in the after school program who came out to help in the garden! All hands on deck! The Hudson Valley Seed staff, Sargent Elementary PTO, Building & Grounds crew and the Administration team have all come together to help create a beautiful new garden space at Sargent Elementary School in Beacon. This new space is large to allow for more variety and food for the students! This effort required the help of so many people and we are so grateful to all who participated. All of the students helped move soil, bucket-by-bucket and put their energy into this new space as well. We can't wait to see their faces when the see the garden booming come September! The building of the inaugural garden at John F. Kennedy Elementary School in Kingston was a huge success! Every student in the school had a chance to participate in building the garden from the ground up! Kids laid down cardboard, built cedar garden beds, filled them with soil, and covered the paths and perimeter with wood chips. Fourth grade classes also had a chance to decorate pennant flags to hang in the new school garden. At 2:30 PM, the Hudson Valley Seed team and representatives from the JFK Elementary School were joined by Principal Dr. Perez, parents, teachers, leaders of other Kingston gardens, and the Ulster County Chamber of Commerce for a ribbon cutting ceremony and to plant of tomatoes and peppers in the freshly filled beds. THANK YOU to everyone who made this possible! We're so excited to start teaching weekly garden classes at JFK this fall! We believe strongly in creating healthy, safe spaces for children and for wildlife. HVS transforms boring mowed grass fields with poor soil into vibrantly active garden spaces on school grounds. In our gardens we use untreated wood free of harmful chemicals for growing boxes and other structures. Pathways are covered with natural woodchips. We do not till the soil, which disrupts the underground ecosystem, but rather we build soil in place by layering mulch and compost that invites decomposers and other soil fauna to enrich and mix the materials. The result of this process is a productive growing space filled with worms, bacteria, beetles, fungi, and other beneficial organisms. In addition to making our own compost with garden waste, we use naturally processed, additive free soil and compost, including certified organic potting soil to start seeds. 90% of seeds we buy are organic and open-pollinated/heirloom, purchased from conscientious, regionally-based companies. Sustainably sourced fish and seaweed based fertilizer is minimally applied to plants throughout the growing season. To manage weeds we use mulch hay and pull unwanted plants by hand. We use safe pest management strategies such as floating row cover, fabric that lays over crops creating a physical barrier to protect plants from insects. The only insecticide spray we use is a homemade garlic pepper solution that is applied sparingly. We try our best to maintain balanced ecosystems in our gardens. Endangered native ladybugs are purchased and released as biological control of aphids, an insect pest that attacks many garden crops. Our gardens serve the ecological community by offering a healthy habitat and food and refuge in urban areas. Alongside our vegetables we plant flowers for pollinating insects like native bees and butterflies. We have found praying mantids and toads living in intentionally created garden spaces. Many species of birds are invited to feast on the critters that live in the rich soil and the sunflower seeds. We leave standing dead sunflower and corn stalks throughout the winter for birds to perch on above the snow. Each garden has a compost pile where we put plant debris and kitchen scraps to be recycled into useable, nutrient-rich soil. In these piles we see interesting ecological interactions such as earthworms decomposing dead plants and spiders eating ants. These gardening practices are Hudson Valley Seed's way of caring for and improving the environment of the communities where we work. You can do this experiment easily at home - sure to delight kids of all ages! On February 21st. 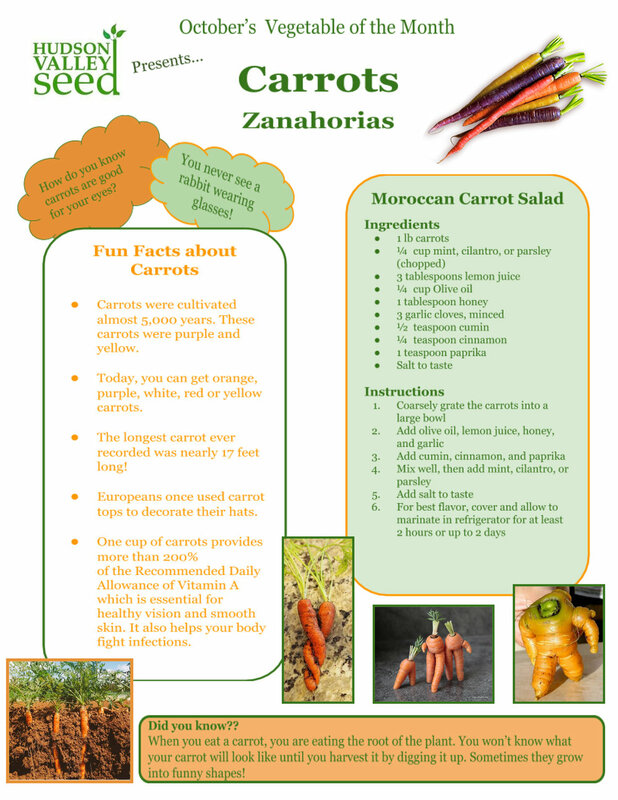 Horizons on the Hudson Elementary School held Hudson Valley Seed's first cafeteria vegetable taste test in Newburgh! Students in Kindergarten through 5th grade were met with a special dish when they entered the school lunch line: "Beets n sweets," roasted beets with sweet potatoes, which were our featured vegetable of the month. Students that sampled the dish were given a sticker to add to a poster to use to vote whether they liked the vegetable or not. Students loved trying the sweet potatoes and really enjoyed participating in the voting process. The results were very encouraging: by nearly a 3-1 margin, students indicated that they liked the sweet potato dish! The cafeteria staff at Horizons got in on the fun and encouraged students to try it. Parent volunteers were on hand to help distribute stickers and also encourage students to try the sweet potatoes. All in all it was a wonderful way to kick off cafeteria taste tests in Newburgh. In March we hope to hold taste tests in all of the Newburgh elementary schools where we work. This hummus was a big hit with our students this month. Make some to snack on with your kiddos and let us know how you all liked it! In a mixing bowl, whisk together the butternut squash, egg, almond milk, maple syrup, and vanilla extract (wet ingredients). In a separate bowl, stir together the flour, baking powder, salt, cinnamon, and allspice (dry ingredients). Pour the dry ingredients into the bowl with the wet ingredients and stir to combine until any lumps are out. Heat a large skillet over medium with enough oil to coat the surface. Pour a scant 1/4 cup of pancake batter on the hot skillet and cook about 2 minutes, until the sides have firmed up and air bubbles rise to the surface. Flip and cook an additional 1 to 2 minutes, or until cooked through. Repeat with remaining batter. Omari Washington has been chosen by Hudson Valley Seed’s Board of Directors to serve as Interim Executive Director. He has served as Program Coordinator for the organization since the Fall of 2016. 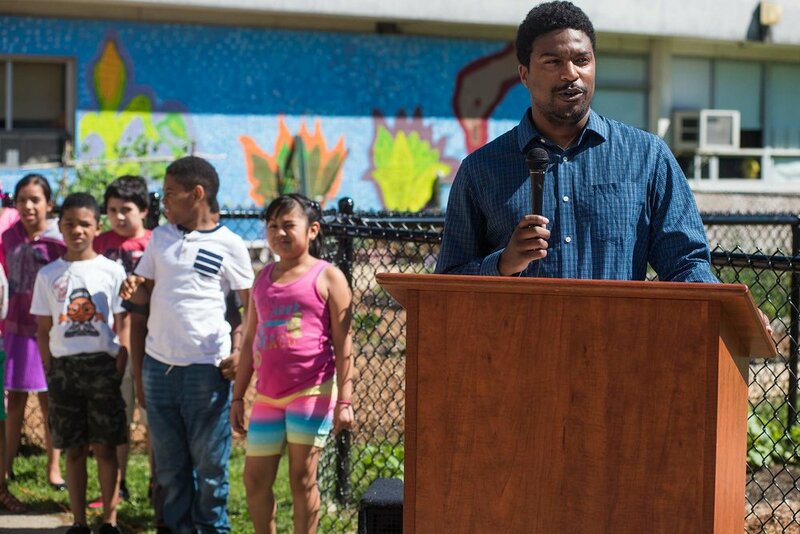 Omari replaces HVS’ founding Executive Director, Ava Bynum, who started the organization in 2012 working with an initial group of 56 young students at Sargent Elementary in Beacon, NY. Today, the organization provides garden-based food education for over 4,000 students at 9 schools in Dutchess, Putnam, and Orange counties. With over a decade in leadership positions at environmental organizations in New York City and the Hudson Valley, Omari brings important experience to this position. He will focus on managing day-to-day operations of the organization, leading fundraising activities, serving as organizational spokesperson and maintaining strong relationships with school districts and community partners. In addition, Omari will lead the expansion of our program into Kingston this spring. The board and staff of Hudson Valley Seed are pleased to have Omari take on this new role with the organization. Omari will serve as Interim Executive Director beginning on January 2nd, 2018. You can reach him at omari@hudsonvalleyseed.org. HVS is so grateful to our founding Executive Director, Ava Bynum, for supporting the entire Hudson Valley Seed team during this transition, and we wish her well as she transitions to exciting new endeavors! 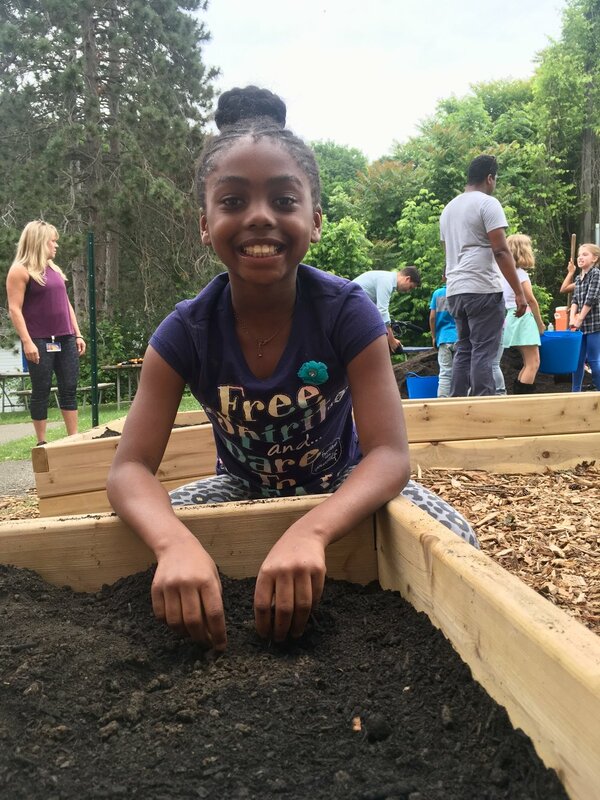 KeyBank Foundation has granted $5,000 to help local nonprofit Hudson Valley Seed bring garden education to the students of Temple Hill Academy in Newburgh, NY. KeyBank has supported Newburgh's students learning through Hudson Valley Seed for three years now, providing essential funding since the organization's first year teaching in Newburgh. Founded in 2012 with one garden and one classroom, Hudson Valley Seed now reaches nearly 5,000 students a year throughout the region, working with teachers, parents, and partnering organizations to teach in gardens at schools in Beacon, Garrison, and Newburgh, including Temple Hill Academy. This year, KeyBank's support is helping Kindergarten, 1st, and 2nd grade students at Newburgh's Temple Hill Academy learn in their newly-expanded school garden for an hour every two weeks. HVS educators integrate nutrition education and experiential learning into public school classrooms by bringing over sixty classes each week out to school gardens to read and write, learn math and science, taste new vegetables, and learn about health and wellness. 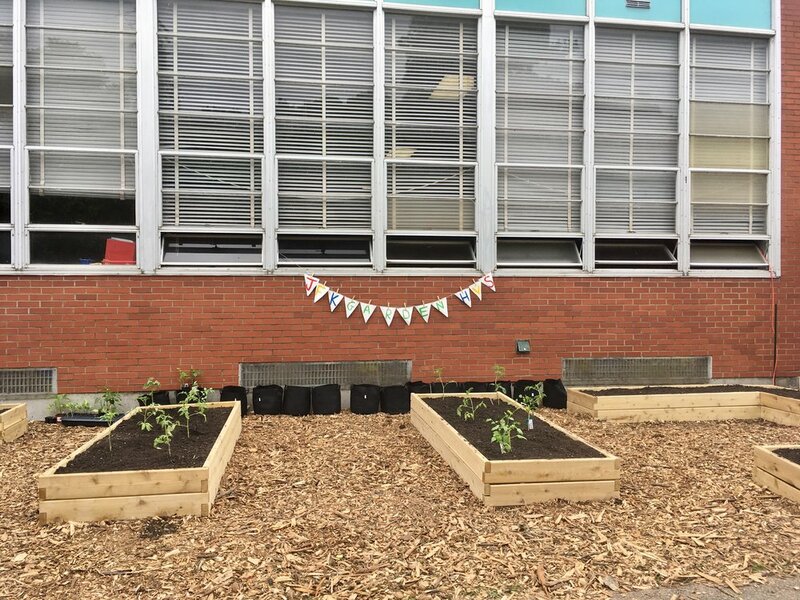 "Over the last year, it's been wonderful to see students take ownership of their school garden as a space to learn and grow," shared Sam Adels, Temple Hill Academy's Hudson Valley Seed garden educator. "Our new expanded garden space has allowed us to use the garden as a place to gather, read, prepare and taste fun recipes with fresh vegetables. Students have been trying tons of new veggies, including some that they've pulled from the earth themselves. We've really noticed students' increased willingness to try new things and appreciate vegetables, and to wake up their minds during the school day." Through supporting hands-on learning, dynamic living classrooms, and engaged students and teachers, KeyBank is making it possible for Hudson Valley Seed to raise the bar of academic achievement one school at a time and build the foundation for Temple Hill students' lifetime of healthy eating choices.